The Twin Cities might be known for its’ sub-zero winters and skyscraper-climbing raccoons, but there is no shortage of healthy eats, cozy yoga studios, and truly enchanting boutiques. Together, Minneapolis and St. Paul are their own little wellness Disneyland. 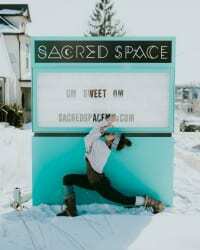 We asked Sacred Space’s owner (and Twin Cities native), Caitlin Gottschalk what her top picks were for soaking in all the good-vibes Minneapolis + Saint Paul has to offer. Sacred Space is a sanctuary for your personal yoga or meditation practice. Our supportive community is built to serve both new-comers and veterans to meditation and yoga. We offer guided and self-guided classes that can awaken a novice practice or deepen an existing one. Already have a yoga studio or home practice? Sacred Space aims to support those looking to find affordable ways to enrich your self-care to new depths with bi-weekly moon meditations, private Reiki Sessions in our Yurt or come to a community Crystal Soundbath on Sundays at 10a! First month unlimited: $35. Sign up in-studio. All welcome. Craving some heat? Check out one of Studio One Yoga’s heated vinyasa or hot classes. Studio One welcomes anyone who is ready to relax, work hard, laugh or let go. In addition to offering heated yoga, they also have a wide-array of restorative, yin, and beginner-level classes to suit all styles and moods. Find yourself in Saint Paul? Stop by Tula Yoga + Wellness on Snelling. This cozy exclusively by-donation studio has a wide array of daily classes and also offers aerial yoga. It’s a mellow and welcoming space with heartfelt teachings, guaranteeing you a blissful morning, evening, or afternoon. J. Selby’s is a plant-based eatery location in St. Paul, Minnesota with a menu FULL of delicious food (a must-try is the vegan buffalo wings made from deep-fried cauliflower). J. Selby’s serves both familiar favorites and new, exciting dishes all re-imagined and recreated as completely plant-based fare to help us all move toward a sustainable, environmental friendly, compassionate way of enjoying food. This awesome new addition to Saint Paul is great for a quick, healthy-bite. If you are looking for locally-grown, sustainably-sourced, wild-crafted, and hand-picked meals that taste like your grandma made it, this is your spot. Tiny Diner has an abundant garden outside where you can see fresh herbs get plucked and added to your omelette (true story). The Tiny Diner and Farm is a small place with big ideas. Every month they pay tribute to diner towns across the USA, exploring different ways to use our Midwestern bounty. They produce energy with their patio roof and solar array, increasing urban soil fertility, and create a natural habitat for pollinators and urban wildlife. If that isn’t enough, they make an amazing Sage Cream Soda. Sip and savor on the adorable patio. Passionflower features wholesome wellness shakes, superfood smoothies, and recovery beverages that are as beautiful as they are nutritious (expect unexpected ingredients like coconut cream and dragonfruit, and churro whey powder). Founded by Danny Litin, this locally-born gem is is made to fuel your body and sweeten your soul. Passionflower is conveniently located in the heart of Alchemy, which offers hybrid yoga, strength, and intense conditioning to change the body and renew the mind. The Future is a project space, artist market, Aquarian lab, artist residency, library, workshop and event space in South Minneapolis. The storefront is a small retail space that features a curated selection of handmade offerings by artists, witches, weirdos and healers, with a focus on items to make a body or space more powerful and positive. Think: rare, handmade tarot decks, crystals-a-plenty, and hand-wrapped sage bundles. The shop is always shifting it’s material and offerings so check back often. It sits next-door to Imbue Yoga which is one of the most quaint and calm studios in the area. Khazana (the Urdu word for “treasure”) is a gallery, boutique, and community gathering space located in Minneapolis. Owner Anju Kataria started collecting treasures from around the world as a child growing up in India, and continues to travel globally to meet and work with passionate craftspeople. Khazana lives up to it’s name and is a true hidden-gem. The artifacts and treasures in this epic space have the power transport to another time and place entirely. Anju’s eye and care for her finds is impeccable—if you find something for yourself there and are lucky enough cross paths with Anju, be sure to inquire about it’s story. If you’re looking for luxury incense, incredible candles, or face-care so good you could practically eat it, this is your spot. Duke Albert is a new lifestyle collective bringing chic-casual home goods, apothecary, books and other sundries to the heart of Northeast. They always have a rotating selection of perfectly curated finds the owners are down-to-earth and the vibes are oh-so-sweet sweet. It’s one of the best treat-yo-self spots in the neighborhood. Como is right by the water and home to Spring Cafe. (Easy grab-and-go eats. You have to try their $3 Elote.) The Pavilion is known for outdoor concerts, musicals, and other performances, but it’s also great place to just stop and soak in your surroundings. Within walking distance, you can visit the Como Zoo and Botanical Gardens, or you can take advantage of their kayak, pedal boat, canoe, or paddle board rentals! Best part—they also offer donation-based yoga on Wednesdays and Fridays at 10am with Sara Wait. CHS Field is home to the Saint Paul Saints and is located in Lowertown, a vibrant neighborhood on the east end of downtown Saint Paul. Lowertown is well-known for its thriving arts community, beautiful parks, unique historic character, and a booming farmer’s market. Tickets for games are under $20—if you’re around for a Friday Home Game, make sure you stick around for fireworks afterward. Offered all over the city. Check website for full calendar. Parks across both Minneapolis and Saint Paul offer free movies (both old and new) during the summer months. Bring-your-own blankets, snacks, pillows, friends, and probably bug-spray. The shows start 15 minutes after sun-down. Can-Can Wonderland is an artist-inspired and designed 18-hole mini golf course. It lives up to it’s name as a wonderland—prepare for wild murals, live music, crazy cocktails, oodles of vintage pinball machines, and an evening full of whimsical entertainment. If you are looking for a place to unplug, unwind, and get pampered then scoot on over to the new Salt Salon, Spa & Cafe. They have full salon services if you’re looking for a cut, color, mani or pedi. But they also have one of the most beautiful salt caves in the metro—and we have a few! Bonus? They give you a complimentary pot of french-press coffee or loose-leaf tea while you wait for you appointment. The ambiance alone is worth the stop. Caitlin Gottschalk is the owner/founder of Sacred Space Yoga + Meditation Studio in Northeast Minneapolis and the founder of CTG Yoga. She holds a 250-hour Vinyasa Yoga certification through CorePower Yoga in 2008. She is trained in sacred geometry level I and Reiki I attuned by Jeanne Daniels, CHHP, CHT. Cait has been infatuated with crystals, soundbowls, animal totems, and other Earth magic for many moons and is passionate about sharing this ancient magic with others to help cultivate and create sacred space from the inside out.